A week ago I found Samsung SyncMaster 245b 24″ LCD monitor from trash. I tested it and it did barely power up. Blue led lighted in power button but nothing else. 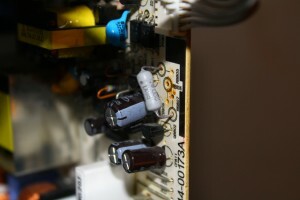 From the beginning I suspected powersupply, because its most common problem with LCD TVs and monitors. I opened display and started to examine the patient.Surprisingly all caps looked and measured ok. I googled the problem, and found out that resistors RB805 to 807 could be faulty, because of undersized power ratings. They had glue mess over them, which had turned to brown and fragile. And one of these were burned open. It measured infinite, when 2 other measured 75 and 82ohm. This were probably easiest fix I could wish. I noticed that all of these 3 resistors are connected to series, and they are 68ohm 1W resistors. I replaced them with one 3W 220ohm resistor, even tough originals were 204ohm together. 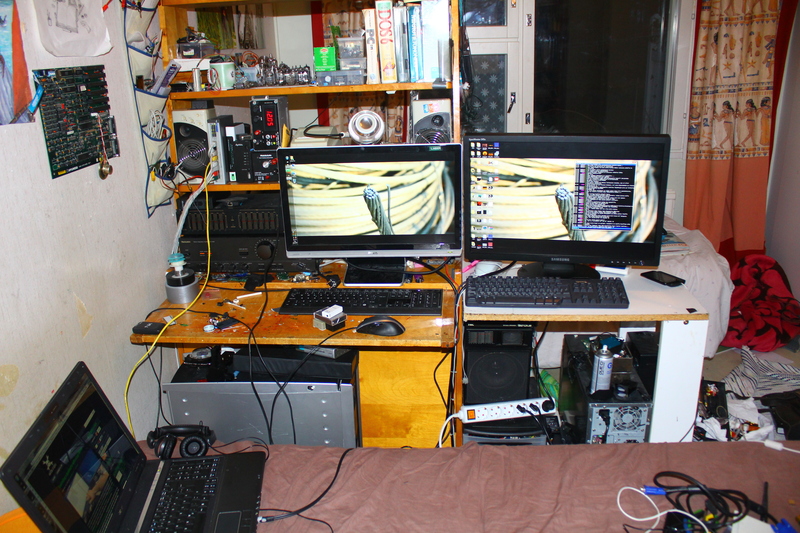 Yeah I know, my room is a mess, don’t mind about it. Display is fully working and have pretty much same quality as BenQ 22″ at left. hi! i have this problem with this monitor, it works fine like two days or something then screen goes black but it is powered. If you hit couple time in the back of monitor picture comes back. Do you have any ideas what that can be? Hello! First check all cables just to be sure (but screen going black seems like internal fault tho). It could be bad connection or solder junction, that goes loose when monitor warms up. I would pinpoint it to backlight. Try to see, if there is still image on screen when it goes black, use flashlight in right angle to see if monitor displays anything. If you feel brave enough to open it (with your own responsibility of course, make sure it is unpowered), then check if any internal connector is lose, wiggle them around, especially backlight connectors (pink and white rubbery cables). 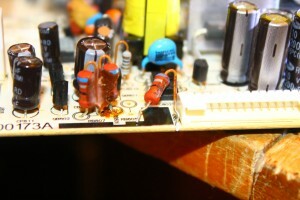 If that does not help, it is probably bad component or bad solder junction. Bad soldering may be visible, but if not then it is kinda hard to find where the fault is. Same goes to components. It may be the same resistors that I had to change, as they were burnt open, and would not make contact to resistive film anymore. I would gently tap around the power supply with insulated tool, and slightly wiggle some components around and see if that helps. Cold spray would also bring fault apart. But these would mean powering the monitor and waiting to fault appear, and I can not recommend doing anything 240v repair stuff. PSU board that is certainly behind the fault contains capacitors that can maintain charge even after unplugging the monitor so do not do anything you don’t have knowledge. I hope this helps even little. Thank you! i will try these tips if it goes again black.. now it works again but just for a while i think. Note that the new 3W resistor will be just as stressed as the three original 1W resistors. If you want to be on the safe side, use three 2W 680ohm resistors or a single 6W 2200ohm resistor. Thanks for your advice! The display is still working fine tho, and is everyday use in our house, so probably just removal of that glue/mass helped ventilation to keep it cool. If display however breaks again with same fault, I will replace resistor with better rated one.